I believe God evolved. I believe in Gods within Nature, even if I don’t understand fully what that means. I believe that new Gods can emerge from this Nature simply through obeying the natural laws needed to arrive at that state. I believe that God once was as we are now. I believe that every being has learned line upon line, precept upon precept. I believe that God is part of a vast, celestial family that has been growing, populating, and creating the multiverse for untold ages. I could be wrong. There are other possibilities. Certainly more traditional Christian theology places God outside of Nature, but this is what I believe. And if Gods evolve and reproduce, then that means that they are subject to some form of natural selection. We can’t know much about the forces that drive celestial selection, but we can make pretty good guesses about a few elements. We can ask, what characteristics will make a God reproductively successful within the multiverse? 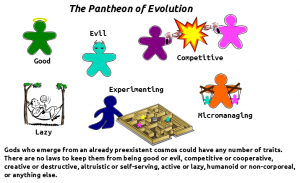 What kind of Gods will win the evolutionary race? Good? Evil? Controlling? Experimenting? One of the key questions is, how many resources are available for the creation of universes and rearing of offspring gods? If you believe that the multiverse is limited in some practical way, then you believe God is evil. Of course, He may not be if there is a statistical distribution, but limited resources always lead to competition. If you don’t compete, you die. Cooperation within a group may be advantageous, but there are limits to that advantage, and competition will always have the potential to yield advantages, at least for certain individuals. In effect, the most successful Gods will be warlords and emperors, or at least rich capitalists. I do not believe the multiverse is limited in this way. If the multiverse abounds in resources, then competition and cooperation become optional. If competition is optional, then competition means expending resources to compete that could have been used to create. Cooperation will win. When speaking of reproduction, Gods who raise the most Gods to reproductive age will be most successful. This can be accomplished through having lots of offspring and hoping for the best, like mosquitos or guppies, or through having fewer offspring and carefully nurturing them, like elephants or humans. If the success of offspring depends on their eventual ability to create universes, I’m going to go with the nurturers. Maybe universe creation can be encoded into some sort of celestial genetic sequence, but I have my doubts that that is the most efficient method. Genes plus teaching and socialization seem to work faster for complex things, as evidenced by the increasing rate of technological change among humans. But will God reproduce faster by creating automatons, or by creating independent, innovative offspring? In a simple enough multiverse, one could imagine figuring out the perfect way to be a God. There might just be a few, or even one, ways to maximize reproductive and creative rates. In this kind of reality, Gods who control every aspect of their offspring’s development, assuring strict standards resulting in optimally successful beings, would win the day. Those who experiment, or are unwilling to control their offspring for whatever reason–even for compassion towards the feelings of their offspring–will lose out in the numerical race. We might get lucky and be born into the universe of one of those compassionate parents, but the chances of it would approach zero. I don’t believe in this reality. This simplicity doesn’t match my experience. Cars, planes, and boats are all effective means of transportation, but which is the most effective? And which car is the one best car, or plane, or boat? And is there a better transportation system we haven’t imagined? While we seek for and often find simple laws and mechanisms that underlie natural phenomena, these simple laws typically interact in ways that get more and more complex as systems get larger. Even if reality is governed by a few simple laws–like maybe some inherent form of agency, and the self-existent and eternal nature of stuff (whatever that is)–it seems most likely to me that the problem of maximizing reproductive rates is very hard, and maybe insoluble. Cloning and micromanaging fail in this complex reality. On the other hand, creating innovators who will seek for new ways to improve reproductive rates in an ever-changing multiverse will be optimal in this reality. This reality grants reproductive success to Gods who enable their offspring rather than control them. Unfortunately for Lucifer, this path requires agency. Most of us don’t usually think of agency as a problem–at least when it is our own. We do, however, recognize the harm other people do, both intentionally and accidentally, when exercising their agency. Even in a multiverse without the need for competition, agency can lead to competition and destructiveness. In the hands of an all-powerful being, it could possibly lead to the destruction of universes, and other Gods. Or it could lead to lazy or selfish Gods stealing universes from hard-working, compassionate Gods. Or it could lead to Gods inhibiting the progress of other Gods so that they can stay on top of the heap, so to speak. Each of these problems would limit the creative rates of Gods relative to those who don’t allow agency, but removing agency inhibits innovation and reproductive success that could result from freedom. The best scenario would be to limit the greatest power only to those who won’t use it to compete or destroy, but how can this be done? I see two possibilities. One is that the laws of nature don’t allow any beings to attain God-like power without being compassionate. Problem solved. I’m not sure what laws those would be, but maybe agency as a natural law leads to that outcome. The other option is that current Gods test their offspring for the traits required for Godhood. What are those traits? Minimally they are the possibility of long life, power to create universes, and great compassion. Long life can be granted. The power to create can be taught. Compassion is the sticking point. How can you test if an aspiring God has compassion? Ask her? Say: “If you are compassionate, I will teach you to have enough power to create universes.” She says, “I’m compassionate. Look, I love puppies! See! I’m petting it so nicely. I’ll be gentle. I won’t cut it in half” (as my two-year-old told me about the frog he was petting in our yard). And you say, “Great! Here’s power over untold lives and the knowledge needed to kill off billions of your own brothers and sisters. I’m sure you’ll always use it properly and never do anything selfish because you were so nice to that puppy while I was watching you.” Perfect. 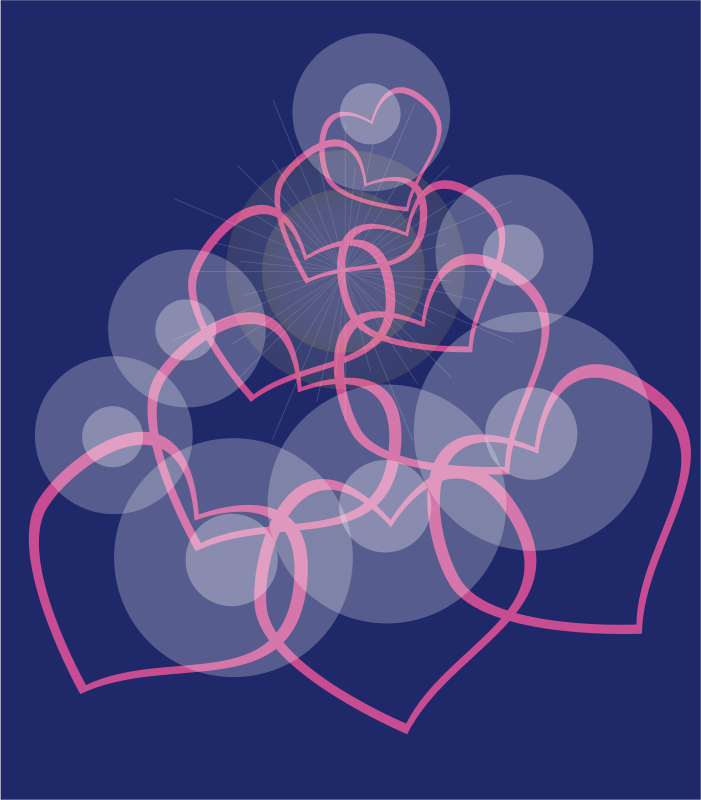 The multiverse is all squared away and we will all become one big, happy, loving family of Gods. Yay! Alternatively, you could run a test for compassion. Maybe take away her memory and put her somewhere where her power is significant, but limited. Put her in a place where success is favored by competition so that she is tempted to be selfish. Make it so she can’t be absolutely sure that any of it matters beyond the here and now, and see what she decides to do. If she acts with compassion despite the temptations to do otherwise–if she acts to show that compassion matters for its own sake and not because it brings some guaranteed reward–then you know. You bring her back and teach her to be a God. If not, you put her on some other path to make her as happy as possible, because you love your children an awful lot. Imagine a single God stepping into His future with the power to create universes and foster new creators. He wants to always be supreme, so He chooses not to create other Gods. For all generations there is one, sole God. Imagine another God who carefully reproduces slowly, limiting the rate of new God creation for whatever reasons–laziness, control issues, inability to do it any faster–that lineage of Gods will increase only linearly. Imagine another God who learns to reproduce exponentially. After just a few generations Her offspring will be very numerous. Unless the offspring compete or interfere with one another for some reason, the growth will be astounding. 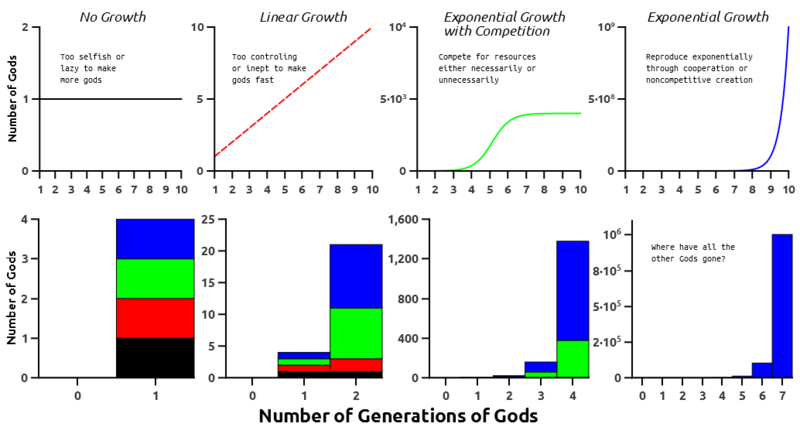 After just seven generations, the Gods who reproduce exponentially, without limiting their growth through competition, will outnumber all other kinds of Gods by so much that we can’t even see the colors representing the other kinds of Gods on the graphs above. Extend this out to hundreds or millions of generations, and the chances that we live in a universe created by any kind of God other than the fastest exponentially reproducing kind approaches zero. Over eternity, any difference in the growth rate order will make the slower growing lineage numerically inconsequential. Gods must be cooperative and compassionate. Gods must be actively involved in fostering new Gods. Gods must enable freedom, innovation, and creativity among the new Gods. Gods must prevent ultimate destruction of themselves or their offspring. Other Gods are going to fail, even if there are no other constraints than these four assumptions. They will lose. Love may not conquer all, but it will at least outnumber and overwhelm everything else. Just give it time. I like the way you put simple Gospel truths into perspective. Though I am not a scholar nor a physicist, I like to think that the endlessness of multiverses goes both ways on the time axis. Thus, it is not implausible that the perfectly compassionate Gods are able to cooperate, even co-create evolving offspring. Then the Great Filter, for us, would be mortal death, when potential Godlike offspring has been tested. I am still figuring out how God measures the accomplishments of His potential heirs, once the scriptures, as of today, attempt to explain His mind in finite, human terms. But I do agree that love-compassion-charity may set the bar for sorting the candidates. 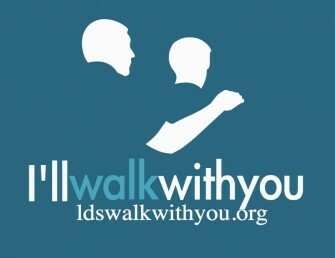 Basic Gospel principles thought in a multi-eternal way. Makes me really want to be more charitable and compassionate… Good job! It makes me feel better about God. I feel like He’s on my side in more concrete ways. Nature is impersonally judging the bad things I do, and God is facilitating the good. Makes me want to be better, too, and I’m glad someone else finds a little inspiration in it. Lincoln Cannon knows about my new book, Your Digital Afterlives, which argues for evolving gods. Lesser gods beget greater gods. Looks really interesting, Eric. I've intentionally kept these posts at a pretty abstract level. I hesitate to place my "faith" in the digitalist view of creation, but think it's an important possibility in trying to understand God(s). My writings are certainly a synthesis more than new invention, as someone like you with more expertise in Transhumanist topics would recognize. I like how, as I've explored these ideas, they have led me back to views of compassionate Gods, and thoughts that we can accomplish good things in this world. One assumption in Bro. Cannon's work is that gods can be of any moral disposition. I find this assumption more than highly questionable. The temple endowment teaches quite clearly and succinctly that only beings of a certain moral disposition are eligible to become divinities. You aren’t alone in that reservation. However, using the temple endowment to arrive at that conclusion is an argument from authority, and thus a logical fallacy, even if it is true. So I started without assuming Gods can only be good, and looked at where the consequences of other kinds of Gods led. In my previous posts, I only required that Gods have one trait to merit the title–the ability to create universes. 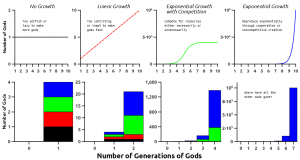 In this post, I added the requirements that Gods reproduce and looked at what traits would be most successful in the kind of multiverse where universe creators are likely and broadly relevant. I find it pretty amazing that the Gods such reasoning leads to are so thoroughly cooperative and caring. I have other speculative justifications for why only good Gods could emerge without intervention. I think agency may be the reason, but that’s for next month. But I have reason to believe that intervention can interfere with the spontaneous processes that only make good Gods and result in the (temporary) emergence of evil Gods. Look at Lucifer. God’s intervention in creating children led to Lucifer–a controlling, micromanaging, warmongering potential God. Why didn’t Lucifer become a God? Did Nature stop him, or did God? What I’ve presented here is one or more reasons why evil Gods won’t succeed, and why God must stop beings like Lucifer from further progression. I could either assume that Lucifer’s plan could not possibly work–even temporarily–or I could assume that it was attractive because it could work, at least for a while or in a limited space. To assume the former, I have to believe that a third of the hosts of heaven were idiots, and that doesn’t sit well with me. So yes, I allow for the possibility that there are evil universe creators, and find that the initial assumption leads to a sort of logical contradiction. That’s one of the things I like about this argument. I like this article a lot, though I think the use of the term competition in the article is confusing. Competition is integral to experimentation. Not having competition means that all solutions to all situations are equally good, so experimentation would not be useful. Furthermore, in order for good Gods to win out over evil Gods, they necessarily have to compete through reproductive success. So it doesn’t make sense to say that good Gods don’t compete. Whether they actively compete through offspring or not, there is competition by default. You can view competition as bad because in the case of limited food, only the animals who can out compete for that food live. However, because of those competitive situations, natural selection has resulted in intelligence that has shifted the focus of competition. Now the competition is about who can create the greatest amount and quality of food with the fewest resources, rather than competing for the actual food. From the perspective of the food supply, what was once a zero-sum game is now a positive sum game. So in the long term competition looks to be good. From that perspective we can understand competition to be a form of collective cooperation. For example, theoretically, a socialist system is most beneficial to individuals, while a capitalist system is most beneficial to a collective. I’m simplifying here because there are many types of both systems. In a socialist system the risks and rewards of innovation are spread across society which reduces competition, but also reduces innovation since innovation and non-innovation are rewarded equally. in a capitalist system, however, innovation is incentivized since successful innovators are directly rewarded, which favors more innovation and tends to benefit everyone since everyone then knows what works and what doesn’t. But at the same time, non-innovation is punished since non-innovators and failed experimenters fall behind. Therefore, in a capitalist system, individuals chance sacrificing themselves to seek innovation which ends up benefitting the collective. So applying these ideas to this framework for Gods, the currency is children and universes. 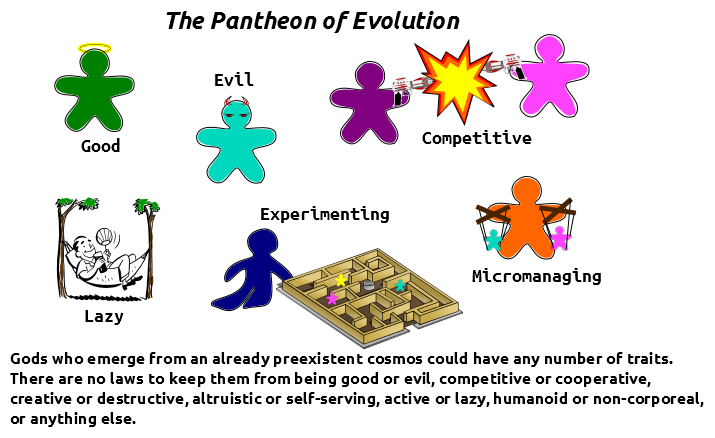 If all the Gods choose not to compete, since there is that option in an unlimited multiverse, we would expect to see good, evil, lazy, and micromanaging Gods. However, if the Gods do choose to compete, we would expect to see rich capitalist Gods and even richer capitalist Gods. All the Gods would be rich because they all have the benefit of seeing the success and failures of the other Gods’ experiments. However, some Gods would end up richer than others because of fewer setbacks. Of course, we might also see diminishing marginal returns for innovation in which case disparity would also decrease over time. One objection may be that some Gods would not share the results of their experiments and thus having an advantage. However, competition favors social cooperation. Those Gods who agree to share the results of their experimentation have an advantage over those who don’t. While one party usually benefits more from a trade than the other, both parties profit, giving all those who trade information the advantage over those who don’t, eventually leading to everyone sharing. Perhaps the term that should be used is warfare. War is always destructive and Gods who war with each other would loose the competition of offspring. I have used competition as a shorthand. Warfare might be better. Or maybe “destructive competition” or “zero-sum competition”. As you clearly saw, my whole evolutionary premise rests on competitive reproduction. It is only active use of resources to hurt a competitor that artificially limits growth rates in an unlimited (or nearly so) resource scenario. I tried to make that clear, but there is room for improvement. Thanks for your comments. I do think there is a problem with extending a Capitalist model into the eternities. There is a kind of assumption of differences that seems artificially unequal, to me. It isn’t an inequality of abilities or merits, but simply an inequality of capital. One with more capital has, de facto, more power, but I believe God’s power will only be successful when exercised with persuation, long-suffering, gentleness, meekness, love unfeigned. I think the power of capital has to go away, and that we need a new economic model. The new model should encompass the best parts of Capitalism, but there will be some very fundamental differences. I’m still waiting to see what it is, because economic theory is not my expertise. It is only active use of resources to hurt a competitor that artificially limits growth rates in an unlimited (or nearly so) resource scenario. Right. Using resources to hurt a competitor is a strategy that may work short-term, but looses long-term. If one God could get so much power that they could always suppress all other Gods combined then it might work long-term, but they would have to first get that much power amidst competition, so I don’t think it could happen. I don’t think “destructive competition” is a good term here because often we want destruction. We want bad ideas and evil Gods to fail. I don’t know about “zero-sum competition”. In the example I gave with food, we had zero-sum competition that turned out to be beneficial. There might be other cases of zero-sum competition that will turn out to be incredibly beneficial, so I’m not sure I want to rule it out yet. I’ll have to think a lot more about it. But I don’t think warring gods, at least not offensively warring gods, would have any chance of winning out long-term. I do think there is a problem with extending a Capitalist model into the eternities. It depends on what the capital is. Economics deals with any case of scarcity. In an unlimited multiverse, raw physical resources aren’t capital. In this framework, a God’s posterity is capital if Gods don’t have an infinite posterity at any given time, and is therefore scarce. It works as capital because a God who has more children who follow after them would also have more grandchildren, and so a greater posterity and more power through that capital. Also, I do think there is an inequality of abilities and merits, as Abraham 3:18-19 suggests. 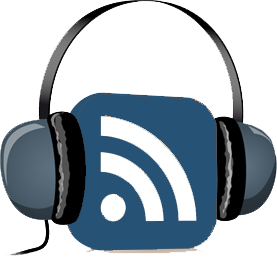 Persuasion, long-suffering, gentleness, meekness, love unfeigned are all social technologies. So a God who can use that technological capital has a huge advantage over one who can’t, just as a factory owner who can use robotics has an advantage over one who can’t. “Capitalism” is a problematic label because it has so many unfortunate negative connotations, but I do think it’s the same underlying economic functionality. And, by the way, I think you have very good economic reasoning, which is part of why I enjoyed the article so much. Good thoughts. Thanks. I’d be interested to see more of your thoughts if you pursue this further. Thanks. You’ve really opened my mind to a new way of thinking about this and I do want to pursue it further, so I’ll let you know what I come up with. I’m sure most people would be appalled at the idea of thinking of Gods as capital for other Gods, but I think it actually underscores the importance of agency and compassion. I just need a time when I’m not quite so busy to formalize my thoughts.